DAY ONE: Welcome to Mexico! Depart home on your flight to Mexico. ​Arrive in Mexico City, meet your Guide, and transfer to your hotel to settle-in. Arrival time permitting, celebrate Mass at a nearby church and explore the surrounding neighborhood. Come together as a group for your first authentic Mexican dinner. Then, turn in for the night to rest up for the days ahead. Journey to Guadalupe and enter the Shrine of Our Lady of Guadalupe to begin your pilgrimage with Mass in the brilliantly colored modern Basilica. Join your prayers with those of others as you kneel before the altar displaying the astounding Tilma, the actual sackcloth bearing the miraculous image of the Holy Virgin. See the Old Basilica (1709) with its twin towers, one of the most beautiful in Latin America. Continue your pilgrimage at El Cerrito, the chapel built on Tepeyac Hill at the site of the first apparition. Climb the stairs rising to the summit, and reflect upon the significance of Guadalupe’s message for our time. In the afternoon, head north into the ancient world of Teotihuacan and its monumental archaeological discoveries. At a time when most European cities were little more than villages, Teotihuacan was the largest city in the pre-Columbian Americas and most likely the world. This pre-Aztec city contains the Pyramids of the Sun, an amazing 215 foot high pyramid, the awesome Pyramid of the Moon, the Temple of Quetzalcoatl with its enormous ornamental snake heads, and the grand Avenue of the Dead running the length of the city. Return to Mexico City for dinner and overnight. 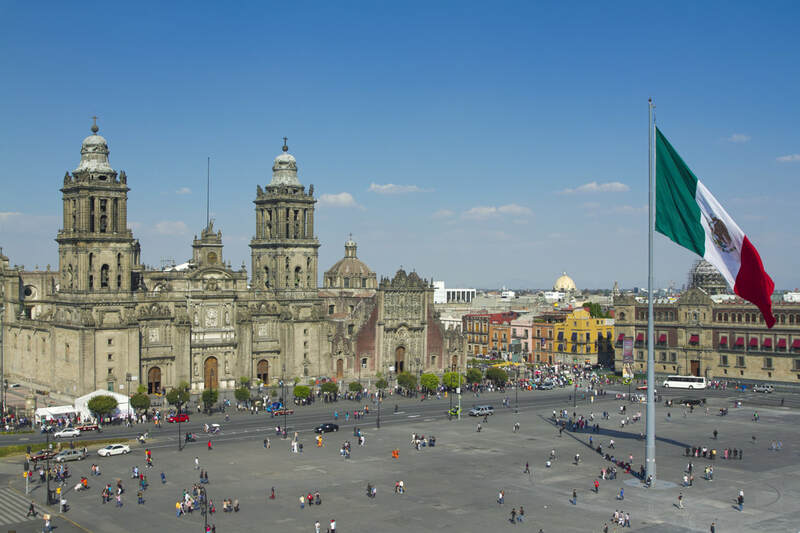 Today, visit the great sites of the Capital on a tour of Mexico City. Stroll through the Plaza of Three Cultures - where Aztec, Spanish, and modern Mexican cultures meet - and The Zócalo (main square, pictured right). Step inside the Metropolitan Cathedral (also pictured right) and the National Palace before celebrating Mass at the Church of St Francis of Assisi, a masterpiece of Spanish baroque architecture. Dinner and overnight in Mexico City. Travel through the eye-opening Mexico City suburbs for a missionary day of service at a Missionaries of Charity Sister's House* (pictured left). Hearts will be moved by the infants, teenagers, and elderly who have been abandoned by their families due to an array of disabilities. There will be time to play and enjoy their company, but also time to serve them by cleaning, helping at meal times, and responding to other needs and requests. ​At day's end, pray and give thanks for your missionary experience while celebrating Mass at the Metropolitan Cathedral. *Your group may serve an alternate Missionaries of Charity project, depending upon where the need is the greatest. ​Venture east of Mexico City toward Puebla, passing by the Great Pyramid of Cholula. Visit the holy shrine of San Miguel del Milagro. Celebrate Mass at this site where St. Michael the Archangel appeared to Diego Lazaro in 1631, directing him to the Grotto and to a well of miraculous curative waters. In the Basilica of Our Lady of Ocotlán, see the perfectly preserved statue of Our Lady that was burnt into a tree trunk after she appeared to Juan Diego Bernadino in 1541. 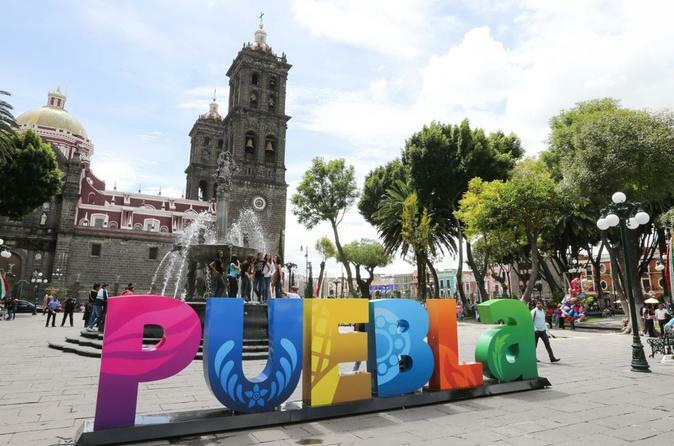 ​In the afternoon, explore the UNESCO World Heritage city of Puebla. Visit St. Francis of Assisi Church to pray before the incorrupt body of Blessed Sebastian de Aparicio. Dinner and overnight in Puebla. Depart Puebla for Mexico City to catch your flight home, carrying with you the graces of this extraordinary pilgrimage. ​Mass will be celebrated daily, except on air travel days. Your Mexican pilgrimage starts HERE! Exact dates or general timing are welcome For example: "June 15-23, 2019," "October 2019," or "Spring 2020"